I just… I’m gonna go hug a celery stick or a chicken wing or something. Got a Weekend WTF? to share with the class? Send it on over to wtf@blackgirlsguidetoweightloss.com! The rib shaped patty, smh. If I’m craving something like that Morning Star Farms has something similar but it’s soy. I have to thank you for the site, I’ve been on a road of self re-discovery and the journey is difficult but knowing I’m not along in my lifestyle change is a great help. 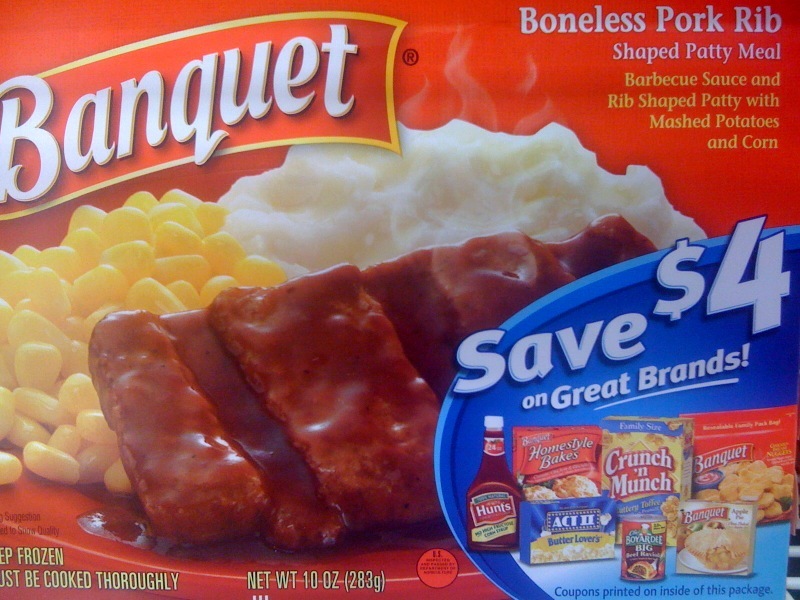 I don’t really eat frozen or packaged foods (never have) but I have a question: what would be the purpose of meat shaped…as another type of meat? This is beyond bizarre to me. Lol. Umm… what kind of meat is this? notice how the font gets smaller to mask the fact that we don’t know what this “rib shaped patty” is made of LOL also, where are the veggies? two starches… really? If I’m gonna fall off my new lifestyle wagon gimme some REAL babyback ribs, corn on the cob & collard greens! Well you gotta admit, Lala, the corn and mashed potatoes are veggies….hopefully! lol! I hope it’s not “corn-shaped” or mashed potato “product.” Lol! What the heck is “patty” since they refer to it where chicken or pork or beef should go….!!! And i will pass on the coupons for other terrible mystery foods, thanks! For the reasons everyone has identified above, I don’t even walk down the frozen food aisle anymore. Reducing my consumption of sodium has made a huge difference in my weight loss program. Oh, and reading this blog has keep me many times from falling off the wagon. Thank you and can’t wait to get my shirt. Will wear it proudly. That’a kinda dirty to have coupons attached to unhealthy food. And best believe the coupons are for more crappy food. 2. “Shaped Patty Meal”? The FDA prohibited Banquet from calling it meat? 6. The coupons on the front of the box for more unhealthy food. I know the problem. Pork ribs don’t come in a box. The end.